Dice Duel is an addictive take on Dice Poker! : Play Dice Clubs! Some call it Dice Poker. Others call it Yams. But whatever you call it, dice is the name of the game in Dice Clubs. This classic multiplayer casual game could hardly be simpler. To play it you just need five dice, a scrap of paper, and a pencil — or in this case a smartphone. It works like this. You have 13 turns to tick off 13 different score categories. These are made up of six upper categories, i.e. the six numbers on a die, and seven lower categories, an array of bonuses based roughly on the hands in poker. During each turn you get to throw your dice three times, holding back as many as you like for the second and third. To give you an example, if you throw four 6s you’ll probably want to hold those back and just throw the remaining die. If, after two further rolls, you still only have four 6s, and a 3, say, you have a couple of options. Assuming none of your categories is already ticked off, you can go for the 6s for 24 points, the 3s for three points, four of a kind for 27 points (i.e. the total of all the dice), or the life bet field for 27. Technically you could also tick off something like the 1s, but you would then get no points. It’s not just a question of choosing the highest number. Dice Duel is surprisingly tactical, since you need to consider how likely it is that a sequence of numbers will appear again, and other subtle factors like that. There are plenty of modes to get your teeth into, including Random Opponent, which needs no explanation, Quick Game, which thrusts you into a match against three other people, and Dice Duel, where you can gamble with your precious diamonds. And it’s not all playing with strangers. 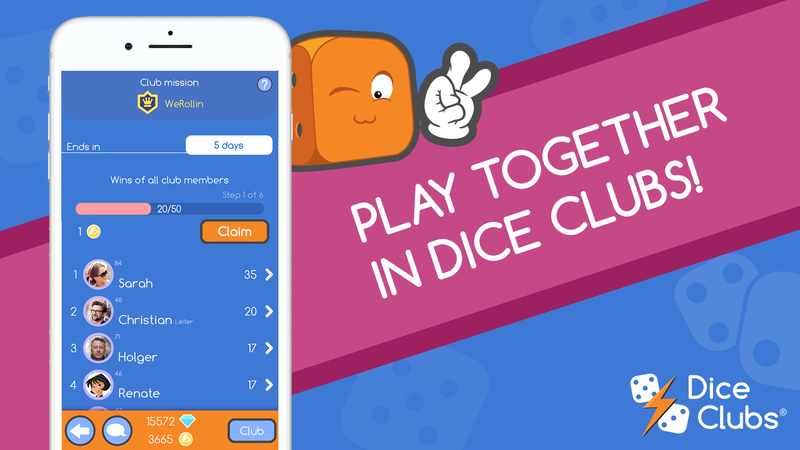 You can find and play with friends, and even, thanks to the game’s latest content update, join or create Dice Clubs. These are a bit like clans, letting you join forces with nine other players and compete in special club missions for extra rewards. Whatever you like to call it, Dice Duel is one of the most accessible, friendly, addictive, and tactically rich multiplayer casual games on mobile. You can download it for free right now on Google Play (and the App Store! ).